When are the services of a facilitator most helpful? What's different about VISION Management Services' facilitation? Roger Schwarz , The Skilled Facilitator: A Comprehensive Resource for Consultants, Facilitators, Managers, Trainers, and Coaches (Revised Edition), Jossey-Bass, 2002, page 5. David Sibbet , Principles of Facilitation: The Purpose and Potential of Leading Group Process , Grove Consultants International, 2002, page IV. A facilitator contributes structure and process (how) so groups can function effectively and make high-quality decisions (what). Participation and consensus are desired outcomes of a meeting. You want to build buy-in and commitment to action amongst polarized groups. Your group or organization has been grappling with the same issues over and over again without resolution. You meet infrequently and want to make the best use of your limited time together. Constructive debate and creativity are needed. We assist boards, management teams and members of communities to engage in strategic and generative discussions. We prime participants for these discussions with topical articles, surveys and videos. Sessions we co-facilitate are stimulating, inclusive and productive. Ruth ensures discussions stay focused and assists the group in reaching sound decisions. She encourages all participants to share their perspectives, raise questions and challenge assumptions. For more involved discussions Sandi ensures contributions from all participants are captured accurately and projected on screen throughout the day. Participants see their comments and ideas along with others’ responses… everyone’s input is recorded and everyone feels heard. In the process of capturing the discussion we assist groups in framing and reframing their ideas and finding common ground. At the end of a session, participants often remark on the value of engaging in the discussion, the number of decisions reached, and their motivation to move a shared agenda forward together. Our reports clearly document the discussion, the context and rationale for decisions reached. Who is responsible for strategic planning? 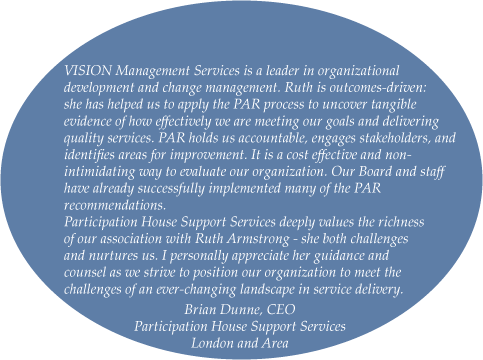 What's different about planning with VISION Management Services? Strategic planning is a process that helps an organization design its future. This involves making strategic decisions about how best to invest limited resources to achieve the organization’s vision, mission and values. Since an organization's vision, mission and values are the foundation of any strategic plan, confirming, refining and/or formulating these statements is a critical part of any strategic planning process. engage a wide range of stakeholders in shaping the organization’s future – thereby solidifying support for strategic choices and new directions. A strategic plan serves as the basis for an operational plan that aligns the work of the organization around clearly articulated strategic priorities and directions. Since strategic planning involves setting direction for the organization, it is typically spearheaded by an organization’s board. While setting direction is a board responsibility, effective planning processes are usually a joint board-management effort. Most organizations involve key staff representatives in planning discussions to ensure front-line perspectives are considered. As part of the strategic planning process an organization’s stakeholders (both internal and external) are invited to think strategically about the current environment the organization operates in (see Guide: ‘Conducting a SWOT Analysis’ below). Collecting and reflecting on this information helps ensure the organization is aware of and prepared to respond to emerging trends. Stakeholders may be engaged via surveys, focus groups and/or interviews. While plans can be developed in a relatively short period of time some organizations prefer to design a process that unfolds over several months (see Perspective: ‘Ready, Set, Plan…’ below). Stretching out the process helps ensure sufficient time is allocated to preparation, communication, engagement and reflection. Our involvement in academia assists us in staying up to date with trends and emerging thinking in the nonprofit sector. Our work in, and knowledge of, different sectors allows us to cross-pollinate ideas and innovations. In our experience, quality information and analysis are critical foundations for strategic planning. We assist organizations in identifying, gathering, synthesizing and analyzing information; we are skilled in designing consultation processes that engage stakeholders. If clients are amenable, we ‘pay it forward’ by sharing non-proprietary information about the external environment that we’ve gathered during previous assignments, so that each client gains access to more information than they might otherwise. As part of our analysis we distill the information gathered to identify patterns, strategic issues and questions. How can organizations plan for the future in today’s increasingly complex and unpredictable environments? How can organizations effectively adapt to changing environments in their pursuit of their vision and sustainability? Ruth is a member of the Plexus Institute – a learning community made up of individuals interested in exploring the application of complexity principles in organizations. Most organizations accept that the future is unknowable – external environments are in constant flux and many aspects of that environment are complex and beyond their control. Planning within this context is challenging – but complexity science leads to certain tools that can be helpful. These include identifying minimum specifications– defining only a few key requirements which must be met in order to achieve a shared vision; scenario planning – envisioning and preparing for a variety of possible futures; and multiple simultaneous strategies – following the rapid response cycle of planning, doing, reflecting and acting. Today’s environments are Complex and Unpredictable and exhibit Volatility and Ambiguity... it's a VUCA environment. Leadership’s role in enhancing an organization’s change-ability and sustainability resides in its own capacity to create the conditions that allow people to embrace and shape change. Conditions that support and encourage passion, adventurousness, resilience and resourcefulness enable people to respond to new challenges. For people to respond to challenges they must be able to access and integrate vast quantities of information and multiple perspectives. Responsiveness to, and innovation in, complex situations can be enhanced through the use of a combination of intentional and emergent strategies. Diversity of strategies, people and ideas is a key ingredient that improves the likelihood of sustainability. By keeping the flow of information open leaders can encourage everyone to be alert to emerging opportunities and to learn from failure. Leaders should also promote the exchange of ideas within the organization so that everyone is aware of their ability to contribute to make a difference. An organization's success ultimately depends on its peoples’ ability to thrive in complex environments. How can NP organizations evaluate their programs and demonstrate accountability in a way that is practical, credible and meaningful? PAR is a research method that is qualitative, quantitative and participative. It has as its twin goals the achievement of both action and research in the same evaluation method. This cost-effective evaluation approach responds to pressures of accountability, simplicity and responsiveness. Participants (e.g. individuals receiving service and their families) are involved in collecting and interpreting data. The data can be a combination of quantitative and qualitative indicators. This combination strengthens the qualitative data, provides a deeper understanding of the quantitative data and leads to action more directly. In community or agency settings where it is difficult to use traditional evaluation-experimental-research methods. The nonprofit community-based sector can benefit from PAR's inclusive approach. When achieving understanding (through research) and action requires responsiveness to the situation and people involved. Participants and researchers learn from experiences and move towards a better understanding of elusive issues. PAR's cyclical process - which includes planning, review and learning - ensures the collected data is used critically to further understanding and action. Multiple sources of data collection ensures the quality of the evidence can be continually improved. Download a copy of “Participatory Action Research: A guide for community-based organizations”. This guide was developed in 2003 for Participation House, London in collaboration with their Quality Outcomes for People Committee. It provides an overview of the PAR process and an explanation of how the process was successfully applied at Participation House. We keep trying to 'fix' boards - but we never seem to achieve the results we seek. What can boards do to have a more positive impact? Boards are often populated by highly skilled and talented people. Why don't boards make better use of this talent? The board’s list of roles and responsibilities are constantly being refined; despite this, boards are often considered to be only marginally relevant. In “Governance as Leadership”, Chait, Ryan and Taylor suggest that the board’s work needs to be reframed. Their framework for board work describes much of what VMS has observed working with boards over the last two decades and offers a fresh framework on governance. Traditional governance models such as Carver’s Policy Governance model create a rigid divide between the Executive Director/CEO and the board. In adhering to this division, the board, the organization, and the community often become disconnected. In many cases this has also resulted in individual board members becoming bored and disengaged. These activities are not entirely new, and most boards are familiar with and comfortable working in the first two modes; unfortunately this often means they spend most of their time on those activities. Some governance models suggest this is appropriate, but it perpetuates the disconnection by keeping board and executive work separate. Chait et. al propose that a balance of the three is desirable particularly over the long term. deciding on what needs to be measured – by connecting externally to the community.